The BeginAgain toy shop is at it again with a fresh crop of imaginative toys for 2014. 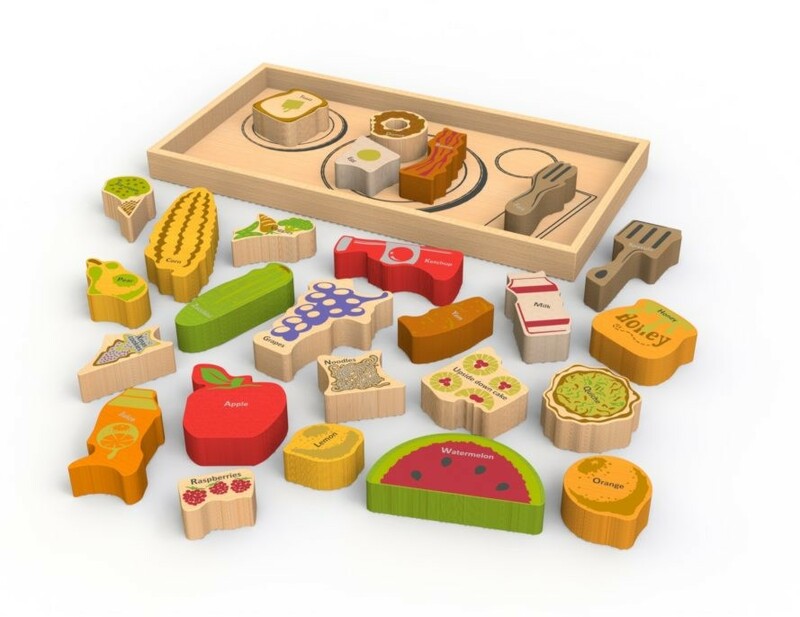 As with past BeginAgain toys, these new goodies are chunky and easy for small hands to handle -- plus they're made with eco-friendly, safe materials such as sustainable rubber wood and non-toxic, child safe stains. Oh yeah, and did we mention that BeginAgain toys are affordable as well? Keep reading to see what's new from BeginAgain. This clever alphabet puzzle serves up a huge dose of learning and role-play fun. Each of the 26 puzzle pieces is a food item, condiment or cooking tool, and each is labeled with its full name, helping kids learn to read. 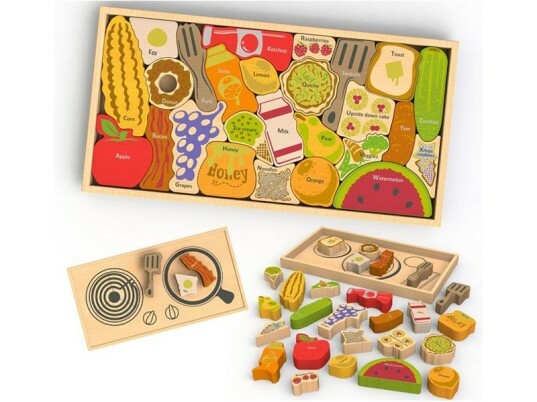 The 10”x 16” wood storage and display tray acts as an illustrated serving tray on one side and a stove top on the other and is a perfect starter play kitchen set. Recommended for ages 3+. This cute Dino Rumbler has a tactile “Nubble” tummy made from natural rubber and a big dinosaur grin. Made for active toddler play, this chunky push-around toy will last a long time and is great for developing fine motor skills. Complete with rubber-trimmed wheels to protect your floors. Recommended for ages 18 mos+. + Dino Rumbler $15.00 – coming soon! Sized for little hands, the Endangered Animals Balance Boat is a fun game the entire family can play. Players take turns stacking until the animals tumble down. This game also helps young children develop fine motor skills and the packaging teaches everyone about endangered animals. 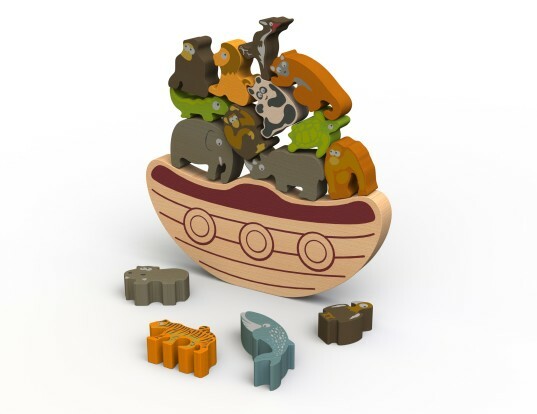 The toy boat is packed with 15 colorful animals to be used for the game and are also perfect pocket pals that kids can use for pretend adventures. Recommended for ages 3+. 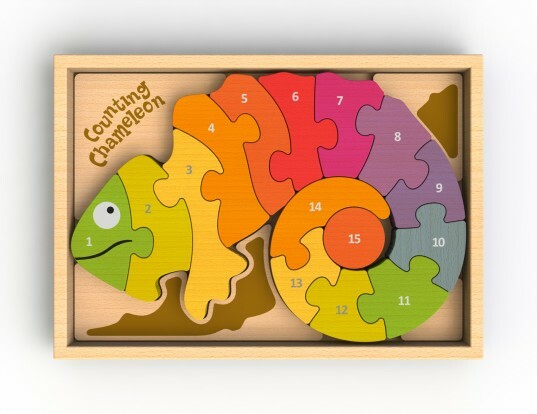 This classic and colorful chameleon is a bilingual puzzle, teaching numbers 1 to 15 on one side and spelling out the number names in both English and Spanish on the reverse side. The chunky puzzle pieces fit sequentially into the display box for a rainbow of counting fun. Recommended for ages 3+. The Tumbler offers flip around, rolling fun! 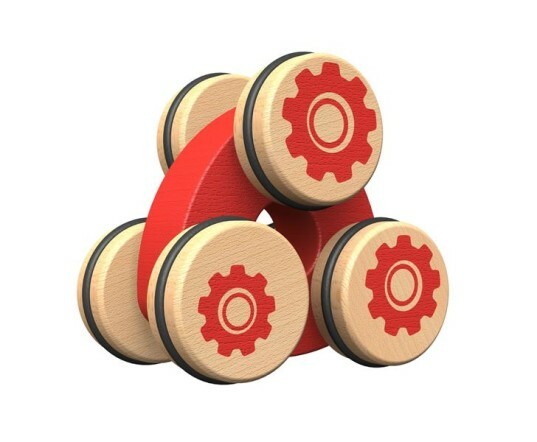 Complete with three sets of rubber-trimmed wheels so your floors stay scuff-free, this unique push-around toy rolls no matter what side is up. Recommended for ages 18 mos+. + Tumbler $11.00 – coming soon! 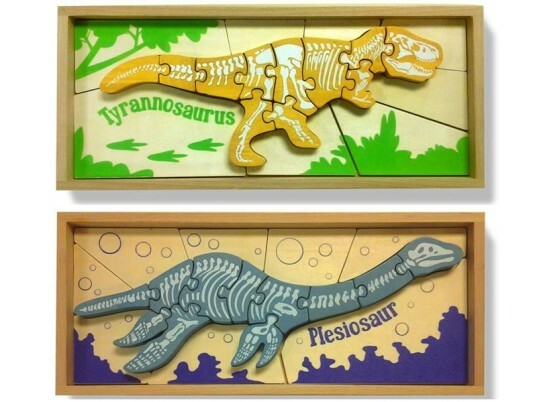 Dino loving kiddos are sure to love these dinosaur skeleton puzzles. 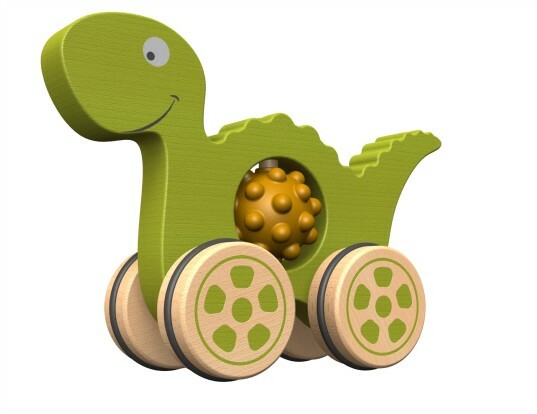 Each chunky puzzle features the dinosaur’s bone structure on one side and friendly-dino features on the other. The puzzles teach your child dinosaur names, and help develop fine motor and problem-solving skills. Three cool dino style puzzles are available: Plesiosaur, Tyrannosaurus, and Triceratops. Recommended for ages 5+. + Dino Rumbler $15.00 - coming soon! + Tumbler $11.00 - coming soon!